If you are planning a party and need ideas to expand your menu beyond the chips and dips, Swedish Meatballs will do the trick. 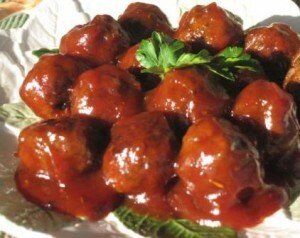 You can make these from scratch, or buy ready made Italian Style frozen meatballs, and cook them in your own sauce. I actually tried the ready made meatballs, and they taste wonderful, with so much less work. Mix the ground meat, onion soup, egg, Italian seasoning and breadcrumbs together into a meatball mixture. Place them on a cookie sheet and bake in the oven at 425 degrees for 15 minutes per side, turning over once. Mix together ketchup, Italian seasoning and jelly. Set the slow cooker on high and cook for 2 hours. I serve my Swedish Meatballs right out of the slow cooker, keeping it on a warm setting, since they taste so delicious when hot. I enjoyed reading the post. I’ve saved you to my favorites. Keep up the good work! I am pleased to hear that. Thank you very much for stopping by and leaving comments. I love reading comments and always answer them. Happy Thanksgiving.